IN TERRY PRATCHETTS Discworld fantasy novels, the Unseen University at Ankh Morpork is home to the Hex computer [Wikipedia entry]. Its circuits are glass tubes through which millions of ants constantly run, hence the sticker on Hex that reads Anthill Inside  an obvious pun on the Intel Inside slogan. 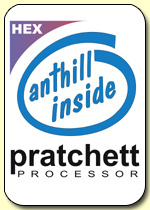 You can buy an Anthill Inside sticker for your own computer too, as well as mouse-mats and other merchandise, from Paul Kidby. Strangely, another connection between ants and computing has come to my attention. The connection is formic acid  the simplest carboxylic acid, with chemical formula HCOOH. 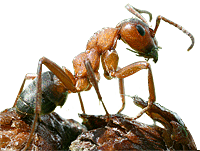 The Southern Wood Ant, Formica rufa, which is Britains largest ant, is able to squirt this insecticidal acid several feet from an acidopore on its abdomen, and uses it as a weapon in the savage battles that often take place in the Spring between neighbouring colonies. The English naturalist John Ray, a Fellow of the Royal Society, first isolated formic acid in 1671 by crushing up ants and distilling them, and the name of the acid comes from the Latin word for ant. Formic acid is now manufactured chemically and has a number of industrial uses: for example, I have watched Malaysian rubber-tappers add formic acid to organic latex to cause it to congeal into raw rubber. At the University of Illinois at Urbana-Champaign, a research group has devised a simple and safe proton-exchange fuel cell powered by formic acid. The cell converts oxygen and formic acid into carbon dioxide and water through a reaction that takes place on a palladium catalyst. The cells are said to be more efficient than direct-methanol fuel cells, and formic acid is also a safer fuel in case of leakage, as methanol is poisonous and can cause blindness. The university has assigned an exclusive licence to manufacture formic acid fuel cells to Tekion, who are developing hybrid Formira™ power modules containing a lithium-ion rechargeable battery and a direct formic acid fuel cell, for use in laptops and mobile telephones. Which is why we can imagine running a laptop on ant juice. Hybrid laptops: true all-day wirelessness for nomads? DIGITAL NOMAD is a term thats come to describe people whose primary place for using a computer is anywhere and everywhere as they move from meeting to meeting. You recognise them by this trait: as soon as they arrive, they are looking for a power socket to give their exhausted laptop a fresh fix of electricity. The truly serious cases also suffer from anxiety if they are not wirelessly connected to the Internet. And theres something of a paradox about being wirelessly Internetted  but forced to crash to earth at frequent intervals to recharge. There are laptops which offer radically better battery performance: this was one of the aims, and indeed achievements, of the team who built the One Laptop Per Child XO machine. In the high street you can also find the ASUS EeePC, with WiFi 802.11n connectivity and up to eight hours of battery power, achieved in part by replacing the hard drive with a solid-state one (as in USB memory sticks). Dell recently announced the Latitude E4300 laptop which is said to give up to 14 hours of continuous battery operation, yet runs Vista and has a proper hard disk. Since most laptops in this class manage only two to three hours on battery, you may well wonder by what feat of engineering this is achieved. The truth, as usual, is a little more nuanced. The E3400 is a hybrid system:its as if it had a EeePC personality living inside the case alongside Vista. The Latitude ON feature means users power up the machine in 5 seconds to a simplified environment providing a small range of communication facilities: wireless and wired networking, web browsing and Skype. In this mode, the E3400 works well as a thin client machine for Net-centric operations. If the user needs to work in Windows apps, they can continue to boot up into Vista. The secret is Splashtop, an innovative operating system solution from Chinese-American start-up company DeviceVM. Computers with Splashtop installed have a modified BIOS, and pressing the power button boots up a compact GNU/Linux OS. The startup screen gives immediate access to a Web browser (based on Firefox 2), photo browser, music player, Skype or chat  or a button to fire up the main heavy-lifting operation system, which can be Windows or Linux. The ASUS EeePC is based around Splashtop, where it is rebranded as Express Gate. ASUSTek announced in May 2008 an intention to deploy Splashtop across a wide range of laptops, motherboards and desktop systems. Details of the workings of the Dell Latitude E4300 and its little brother the E4200 are as yet unclear, but one report suggests that the Splashtop-based Latitude ON system uses a dedicated low-voltage processor. I would guess, therefore, that the estimates of 14 to 19 hours of battery operation are based on a mix of Splashtop-based net-centric operation and Vista-based orthodox working. Which, for many digital nomads, may accurately reflect the working day, though I personally would prefer to have at least a reasonable Open Source word-processor available within the Splashtop environment. GLOBALLY, COMPUTERS USE A LOT OF ENERGY; and given the dominant role of fossil fuels in electricity generation, computing is therefore responsible for a lot of the increase in carbon dioxide in the atmosphere. The carbon footprint of computing is thought to equal to that of aviation (about 3% of global energy use); some put its burden as higher, and it is clearly increasing fast. Attention falls in particular on the impact of data centres, where thousands of machines are racked up to store data, host Web pages, process transactions etc. The density at which these machines are co-located means that for every watt spent on computation and data access, another watt is spent extracting heat, so they are sinners twice over. There has also been a tendency at data centres to ensure operation 24/7 by running the machines full time regardless of the computational load, by over-provisioning, and by adding a layer of uninteruptable power supplies to the infrastructure. In March this year, at the Royal Society conference on ubiquitous computing, I heard an interesting presentation by Professor Andy Hopper of the University of Cambridge, on the subject of Computing for the Future of the Planet. More recently, Andy reprised this topic as the inaugural lecture of the UKCRC. I recommend visiting Andys site where you can find his presentation slides, and the paper he has submitted to the Royal Society for publication. I found myself in agreement with Andys ideas about locating data centres close to sources of renewable energy and moving the bits rather than moving electrical power long distance and suffering transmission losses. I also applaud the work his team is doing on virtualisation, moving jobs around the data centre so as to shut down as much of the system as possible when it isnt needed. But I confess I baulked at his urging that the personal workstation, the PC as we have come to know it in the last quarter century, should be abolished in favour of network-centric storage and services accessed from thin client machines. 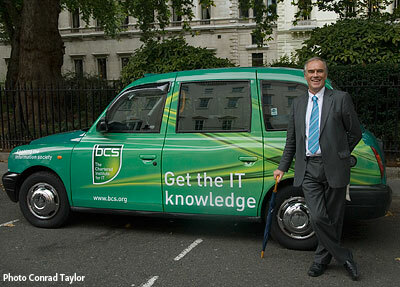 I recently attended a meeting of the Carbon Footprint Working Group set up by the British Computer Society. CFWG harnesses the energies and expresses the concerns of the BCSs Ethics Forum, the Data Centres Specialist Group and the Communications Management Association. Of particular note is the work being done on a voluntary code of conduct for data centre operators, and a project part-funded by the Carbon Trust to develop software to help data centre management model the energy use of their systems and play what-if experiments to find ways of being more energy efficient. However, CFWGs concern doesnt end with data centres. At that meeting, we heard an interesting pair of linked presentation by Bob Crooks of the British government’s Department of Environment, Food and Rural Affairs (Defra), and by Richard Lanyon Hogg of IBM UK which provides Defra with extensive IT support. IBM helped Defra conduct an audit of the energy cost of its ICT systems, using meters and thermal imaging cameras. The results showed inefficencies in many unexpected locations. A frequent culprit was departmental print servers. The survey has led to many reforms, including the abolition of many desktop systems and their replacement by laptops: Richard showed off the Lenovo ThinkPad which is now his sole machine for portable, home office, desktop and hot-desk use. Laptops are great things. The need for them to run on battery power has been a great driver in the direction of energy efficiency. I wrote most of this blog text on an Apple PowerBook G4 laptop, on buses and in hospital waiting rooms. But I wonder  what kind of compromises does one accept by trying to use a laptop for everything? Energy efficiency is a good thing; so is human efficiency. There are three kinds of work I do that are more efficiently accomplished by being done on my desktop machine (actually, my Apple Macintosh G5, the largest computer Ive ever had, is a tower system that lives in a trolley beside my desk, not on it). Media publishing work in Adobe Photoshop, Illustrator and InDesign. It is a great benefit to have as much display space as possible, for two reasons  to see the document being worked on, in both extent and detail; also to have rapid access to the horde of control palettes. Otherwise one wastes much time calling up and dismissing palettes, and scrolling around the document surface: not very efficient! Video editing work. Here the actual products being edited do not need so much display area, but two 720 x 576 video previews need to be accomodated size by side, and editing efficiency is enhanced by seeing a big horizontal slice of the timeline at reasonable magnification. Plus, video editing can require the simultaneous use of many peripherals: in my case, at least one large and fast external drive, and a FireWire link either to my camcorder or my Sony DSR-20P digital VTR. Desktop machines can support more simultaneous connections to peripherals. Now, arguably these publishing applications are one for which even Andy Hopper would make an exception. Editing video on a thin client system is certainly out of the question. But of course, these are specialisms which it would be rare to find in an office environment. Working across many windows  Its not uncommon for me to be writing a paper or a contribution to an online discussion (or this blog), composing text in one window while referring to several Web sites, PDFs and emails, each in their own window. I arrange the windows so I can tell enough by the bits poking out which contains what. At the moment I find I have 15 applications running, which isn’t unusual for me; and 8 open windows plus 7 minimised to the Dock  again, not unusual for me. This behaviour, which I find efficient in terms of research and writing productivity, is supported by the affordances of a 1680 x 1050 pixel Apple Cinema Display. But, hey! I have at times to remind myself that in 1986 I was working on the 512 x 342 pixel monochrome display of a Mac Plus. Many dialogue boxes in modern applications are bigger than that! And what about my first laptop? 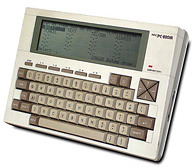 The NEC PC-8201a (see right) had just six lines of forty-column type display. That required something like an orators sense of what point you had reached in the argument evolving just to the north of your fingers. One thing I felt about the Defra/IBM response to the challenge of controlling energy consumption by IT, as expressed in the CFWG meeting, was that their choices about End User Devices were effectively limited by what technology is currently on the market. What if we allowed ourselves the luxury of imagining the EUD of the future? Would it look like a Lenovo laptop? Would it look like a PDA? Id like the EUD of the future to be a small core device that can be extended like crazy to suit the task and environment at hand. Maybe it would be about the form factor of the Asus Eee PC (see Flash presentation), with small tolerable keyboard and trackpad, wireless networking and Ethernet, a daylight/backlit energy-saving screen somewhat like in the One Laptop Per Child XO machine, and about 16 Gb of flash memory. I envisage a clip-on base that provides bulk storage, mains power, a secondary battery or fuel cell and more expansion ports. For efficient desktop use, a better keyboard and mouse could be attached. But for me, the real breakthrough would be how my envisaged device would work with external displays. Some models of Apple PowerBooks already show the way in their ability to hook up to large external displays and run a fully interactive desktop and applications over two displays at once. Lets explore this further. What about being able wirelessly to hook up to a number of displays, some of them forming part of the Desktop, some perhaps temporary repositories to which a document window could be copied for viewing and possibly some touch-screen interactivity? I want an environmentally responsible computer, or End User Device, and one the energy requirement of which scales according to how much work, and what kind of work, I am doing with it. I dont like the idea of entrusting my bulk storage to the Internet, and needing access to the Internet to do any serious work, which is what the thin client model suggests to me. I would like to look beyond the one size [laptop] fits all approach that to me is implied by the choices Defra has made for its staff. I guess Im asking for a lot, but theres nothing new there! How is Defra tackling climate change?  page links to science notes. On the radical energy-saving architecture of the XO laptop, see A Conversation with Mary Lou Jepson (hardware designer of the XO) in ACM Queue. This week on the BBC World Service, a radio programme featured interviews with kids scavenging scrap copper and iron from broken computers, illegally imported from Western countries and dumped at the Agbobloshie waste site near Accra, in Ghana. 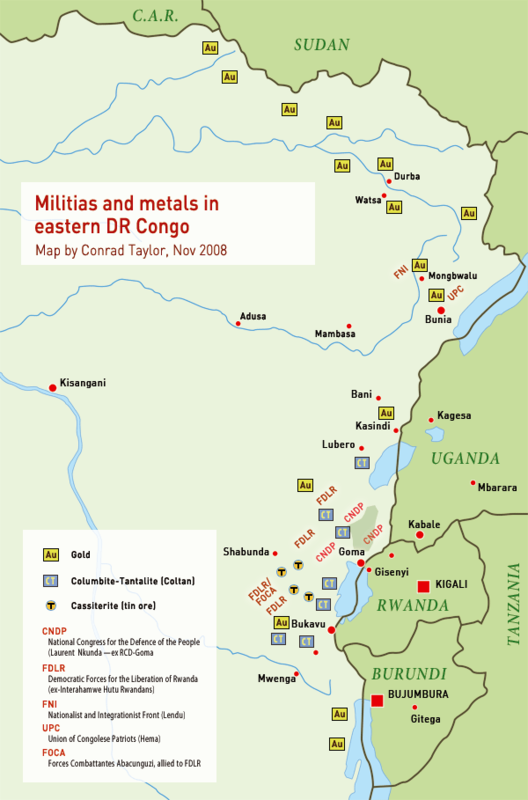 On 5th August, an accompanying article by BBC West Africa correspondent Will Ross was posted, on the same theme. Ghanaian kids were interviewed as they set fire to bundles of cable, then threw dirt on them to extinguish the acrid, toxic fires. They were looking for the copper to sell for scrap. Greenpeace has taken the lead in researching the dumping of Western IT equipment in Ghana. Their researchers have taken soil samples from the Accra scrap market, finding high concentrations of such dangerous contaminants as lead, phlalates and dioxin. The broken computers are landed in containers at the port of Tema: in the period of research, containers were seen being landed from Holland and the UK. There are international laws banning the export of computer waste, but the companies who engage in this poisonous trade get round it by falsely labelling the shipments as usable second-hand equipment. In fact, says environmental journalist Mike Anane, about 90% of the discarded equipment is useless, broken junk. For me, the most gutting thing about this story is that many of the dumped machines showed clear markings revealing their previous ownership: Richmond upon Thames College, Southampton City Council, Kent County Council, London Guildhall University. Organisations like this had better wake up and ask the companies on whom they depend for equipment end-of-life management just what the hell they are playing at.